When you become a parent, your priorities change. Life becomes all about keeping your baby safe, healthy, and happy and that, as all new moms find out, is a full-time job. Sleepless nights and hectic days leave little time for “you”. The lack of time moms have to get themselves ready is well-known and often joked about. You may have even come across funny internet memes with quotes such as “My hairstyle? It’s called Being a Mother”. While there’s certainly nothing wrong with spending less time on yourself once baby comes along, for many moms it can really start to get them down. 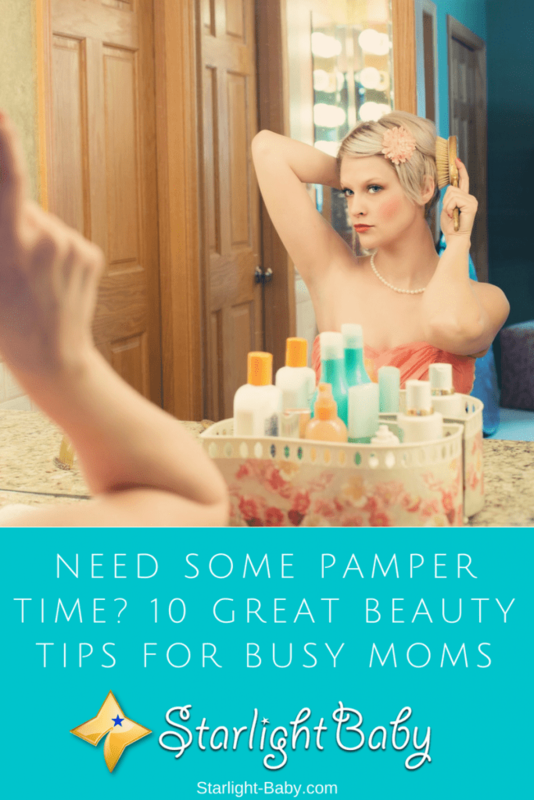 If you’re desperate to get back to “You” again but you really struggle to find the time, here you’ll discover 10 fantastic beauty tips for busy moms. The main tip that’s going to really help you have more time to get ready in the morning is preparation. Prepare your outfit and have a shower the night before once baby is in bed. Then, when morning comes all you need to do is run a flat iron over your hair and you’re ready to go. Making sure you have all of your beauty products in one place the night before will also help speed up your getting ready routine in the morning. It’s often your eyes that give away just how tired you are. Therefore, if you only have time to focus on one thing in the morning, your eyes are what you are going to want to focus on. So, what can you do? Well, if nothing else, a soothing, cool eye gel is must. This really helps to reduce the puffiness under your eyes, making you appear brighter and much more alert. Even if you’ve had a rough night with your little one, a cooling eye gel can make it look like you’ve had a blissful, long night’s sleep. To complement the fresh, bright eyed look, eye drops can help to eliminate “red-eye” – something that’s frustratingly common when you aren’t getting enough sleep! Taking care of your brows is another fantastic tip. A simple brush and gel application can help your brows appear well-groomed. This in turn, helps to give you a put-together look, even if it’s all you’ve had time to do. Even if you’ve prepared everything the night before, there’s still going to be days when there just isn’t time to do a full make-up routine. On these days, sticking to the basics is the best idea. It could be that you just use mascara and a little lip gloss. Or maybe your cheeks could do with a little touch of blush? By sticking to the basics, it takes just a minute or two and you’ll still feel a million times better about yourself than if you hadn’t done anything. I know, this sounds crazy! When you’ve had a tough, sleepless night, the last thing you want to do is set your alarm to wake up early. However, even just 15 minutes gives you the opportunity to wake up, grab a coffee and spend a little time on yourself before you have to deal with baby. Plus, it’s easier to get ready if you’re not trying to multitask! Okay, so this isn’t going to give you more time, but it will make you look and feel better. When you were pregnant, you likely got used to drinking plenty of water to stay hydrated. If you’ve cut down on your water intake, now’s the time to up it again. By hydrating the skin, you’ll achieve a beautiful glow, enabling you to skip the foundation on busier days. Out of all the tips on the list, this is one many moms don’t tend to think about, yet it can make a massive difference to how you look and feel. As a new parent, you’ll likely find yourself turning to saviors such as coffee and red wine to get you through the days and often long nights. The trouble is, both of these heavenly beverages can seriously stain the teeth. Whitening strips can help you achieve a whiter, brighter smile with minimum effort. Some are even designed to work in as little as 2 hours, after wearing them for just 30-minutes to an hour. For many moms, it’s their hair which causes the most anxiety. Doing your hair can take a very long time – time that you just don’t have as a new mom. On very busy days, it pays to cover up a bad hair day rather than trying to tame it. A great way to do this is with a fashionable head scarf. A head scarf can make you look glamorous, without the effort. Similarly, a headband can work wonders too. One problem many new moms have when it comes to looking their best is they just can’t afford it once baby comes along. Skin care products can be expensive, but there are natural products you can use to ensure your skin looks and feels fantastic. Olive oil is one of the best natural moisturizers you can use. If you opt for the extra virgin varieties, they contain a lot of antioxidants. Olive oil is great for both general skin repair and to help clear up sun damage. By using olive oil as a moisturizer both morning and night, it will reduce the need to use foundation on the mornings that are just too busy. If you just don’t have time or the energy to wash your hair some days, dry shampoo can be a godsend. Helping to make the hair look clean and shiny, simply spray the dry shampoo into your locks and brush it out. However, while dry shampoo is great for occasional use, it should never be used every day. It does contain chemicals which can be really damaging to the hair if overused. In the past, self tan was both difficult and time consuming to use. However, these days there are a lot of excellent self-tanning products designed to work in as little as a few minutes. If you’re worried about streaks, it’s worth trying out the gradual self-tan moisturizers. Giving your skin a healthy glow is another way to eliminate the need for make-up on busy days. A very nice article that I think every mom should read. I was one of those new moms that forgot about herself and completely dedicated every second to my newborn. I was just so excited to finally see my baby boy (he was my firstborn). With all of the excitement that comes with the birth, it is so common for us women to forget about our needs and how important it is to make ourselves feel beautiful. I even stopped putting all of the make-up on my face – I was that busy with the baby. Luckily, my partner is a god’s gift and he noticed that I was giving too much time only to the baby and none to myself. He bought me one of those gift coupons for all day spa and told me to go and leave the baby to him for the day. I was very hesitant but I did end up going and loved every second. I felt so amazing after all of the pampering they gave me. it made me feel much better and far more beautiful which showed in my mood and stress levels. Oh yes, that must have felt so awesome to be pampered and all! It does give our energy and self-confidence a boost. These days, when I feel really stressed, I go for a relaxing massage. The fatigue and body pains can aggravate our stress levels so it’s best to give ourselves a break when things become too much. We should not forget to take care of ourselves because if something happens to us, our family will be at a loss. No offense to dads but I do think moms are much better at organizing things at home and with other family needs. Thank you for mentioning a balanced diet and exercise. These are important, too. If moms often skip meals because they’re too busy, it will not be good for the mind and body in the long run. It’s not advisable to skip meals, especially if you’re breastfeeding. What nutrients will your baby get if you don’t eat? And if you have time, exercise will help get you back in shape. My wife is extremely busy. She goes to work, look after the child and also manages the home. My wife not only has to feed the baby but also has to make coffee when I am working. My wife not only washes baby’s clothes but also does the laundry for me. Its not like I don’t help her, but my assistance does not liberate her from her duty and responsibility. Now and then I ask her to look after her. I tell her to exercise and maintain her body, I ask her to dress finely and use cosmetically. However, it is really hard to maintain. She breastfeeds and here nice dress can be spoiled in a second. These are brilliant tips, I am sure these tips will help her.